Successfully Added HK Warehouse Gretel GT6000 Android Phone - Android 7.0, Quad-Core CPU, 2GB RAM, 5.5 Inch, 6000mAh, 4G, Dual Rear Camera (Blue) to your Shopping Cart. The Gretel GT6000 is the perfect device for those of you that are looking for a reliable yet cheap Android phone. This Chinese smartphone runs on Android 7.0. Thanks to this, it treats you to the latest software features that are currently available. This is guaranteed to provide you with a smooth and lag-free user experience. Whether you like to take advantage of the latest Apps, play games, or watch movies – this Android phone can take it all. On its stunning 5.5-Inch IPS display, it will treat you to breathtaking HD visuals. Along with its 6000mAh battery, this Android smartphone brings along up to 16 hours of mobile media entertainment. By supporting Dual-IMEI numbers, this Android smartphone has great connectivity. It allows you to slide in two SIM cards and lets you be connected to both at the same time. This means that you can always be reached by friends, family, and colleagues on two different phone numbers. Therefore, this Android phone is great for separating work and private life. To increase your connectivity even further, this cheap Android smartphone supports 4G. From now on, you’ll always be able to browse the web while enjoying the fastest mobile data speeds out there. Behind its HD display, the Gretel GT6000 hides a sophisticated Quad-Core processor and 2GB RAM. It furthermore packs 16GB of internal storage. Together, this hardware provides you with a powerful experience and lets you enjoy all media without dropping a frame. For those of you that need more storage, the Android phone holds a 32GB SD card slot. Thanks to this you’ll always have enough storage to keep your media, files, and pictures. The latter of which can be snapped with the phone’s stunning 13MP Dual-Rear camera. 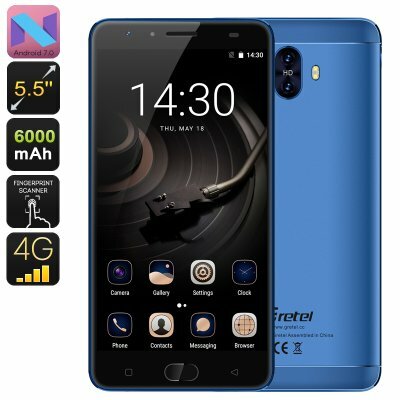 The Gretel GT6000 Android Smartphone comes with a 12 months warranty, brought to you by the leader in electronic devices as well as wholesale Android phones..